Animals > Frogs > What Do Frogs Eat and What Eats Frogs? A frog catches a cricket in the jungle with his sticky tongue. 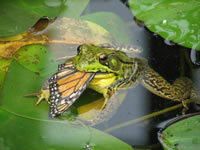 A lot of people have no idea that frogs are not only the prey of many larger animals, but also what frogs eat exactly. Have you ever had a pet frog? If not, that you are probably not familiar with the fact that frogs actually do eat other live prey and are definitely not vegetarians by any means. Insects, snails, spiders, worms and even small fish have all been known to be part of a frog’s diet and while some bigger frogs had been known to go after something as big as a mouse, there are still those frogs that just stick to insects. One of the neat facts about how frogs eat is that they have no teeth. 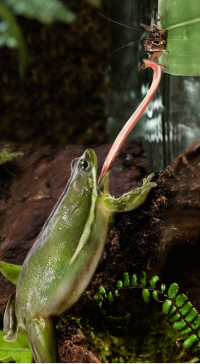 Similar to snakes, frogs have to swallow their entire meal whole because they can not chew anything. Usually, frogs will only use the upper jaw to hold onto their prey, it is not used for biting or chewing at all. One of the most memorable things that people usually pick up on is the sticky tongue that all frogs have. This tongue takes less than a second to roll out and once it is out, whichever insect they are attempting to catch will not have any time at all to react. This frog at Dow Gardens Butterfly House is enjoying a snack. Photo courtesy Ellen Lucy. Another cool fact about how frogs eat is the fact that their eyes help them swallow. As you may have noticed in some of the photographs of frogs up close, when frogs eat, their eyes actually sink through the opening of their skull in order force the food to go down their throat. This is one of the main reasons why it seems as if frogs are constantly blinking while they are eating. 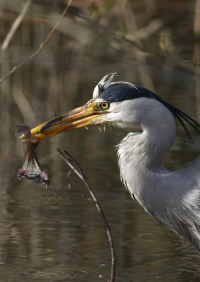 This blue heron bird has caught a frog. When it comes down to it, frogs are pretty low on the food chain. Now, they do have a few defense mechanisms, such as their color being able to change and the fact that they are so fast in their jumping ability, but in general, there are many different animals that make frog part of their diet. Snakes, foxes, dogs, bass, pike, hawks and even seagulls have all been known to fest on frogs on a regular basis, but there are many humans that have made frogs part of their diet. In France, frog legs are definitely one of the top menu items in some of the best French restaurants. While you may think that most of the water frogs may be safe from creatures attempting to make a meal out of them, water frogs are usually a regular diet for many of the sharp-toothed fish and even sharks in the world. If you are out hunting for a frog to make it part of your dinner, be sure that you are watching out for the poisonous frogs. While poisonous frogs do not make their home in every single state, you still need to be careful and read up on the colors of frogs. Many red, blue, purple and even bright green frogs can be extremely poisonous to us humans.